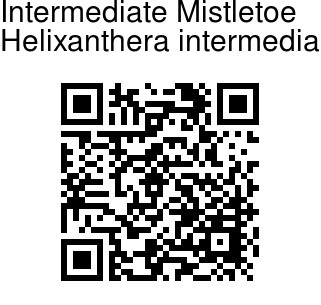 Intermediate Mistletoe is a hairless shrub growing on trees. Leaves are ovate, blunt, leathery, base blunt, flat, or nearly heart-shaped ; leaf-stalk 1 cm long. Flowers are borne in racemes 7 cm long, in leaf-axils, many-flowered; flower-stalk 7 mm long, slender, hairless. Flower buds are 4-angled and curved; petals 4, straight, purplish pink, free to the base; stamens 4; filaments attached below the middle of the flower; stigma spherical. 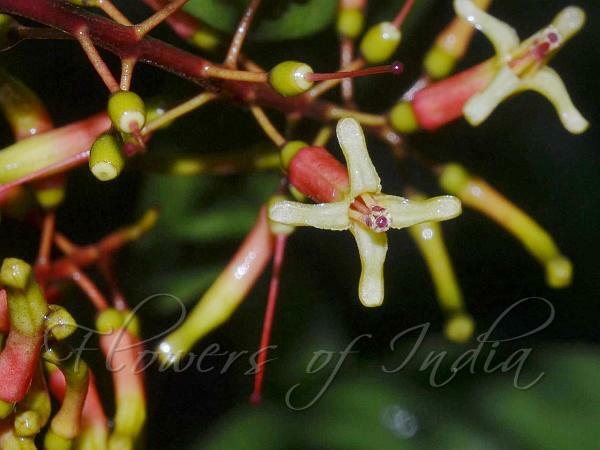 Intermediate Mistletoe is endemic to Southern Western Ghats. Identification credit: Anurag Sharma, Surajit Koley Photographed in Chikamagalur, Karnataka.